Our services include upstream, midstream and downstream facilities located onshore, offshore and deepwater, in extremely challenging climate and terrains. We continue to seek ways to supply for helping our customers’ business transformation. Despite being a global organization, we work closely with Iran government to help them identify best quality work better with final bright conclusion. We have long-term alliances with many of our customers through our holding group to ensure that our commitment is long term and where possible, help our customers achieve profitability and gain efficiency from their older assets and promote much leaner and less bureaucratic processes to ensure business integrity. Petrosadid supply all requirements from equipment, piping material and instruments to submarine cables and hydraulic packages in deepwater solutions. Our service includes concept selection, engineering design, inspections and testing, shipping, installation support, start-up and operation of floating systems of all types. We can provide all requirements of best-in-class Sulphur technology, including towers, adsorbents, machinery equipment and all material range of piping and instrumentation. Our partners have a long history will of the main licensor all over the world. From the largest integrated mega-decks to the smallest wellhead platforms, our experience and knowledge of our partners ensures we deliver maximum value to our customers. Petrosadid provides end-to-end services to our customers and is able to help increase productivity and improve the performance of oil and gas processing plants. At Petrosadid, our customers and partners understand the entire LNG value chain, associated technologies and local requirements, and combine this expertise with their technology approach. We deliver cohesive procurement management services for all aspects of liquefaction and regasification projects. From transportation pipelines and pre-treatment facilities to liquefaction and regasification modules and storage terminals, whether onshore or offshore, including all associated infrastructure and environmental services, regardless of throughput capacity. 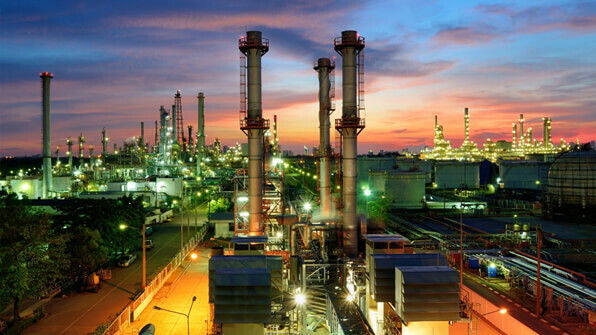 Our range of activity in Petrochemical Plants includes but is not limited to: synthesis gas based products including ammonia, methanol and their derivatives; ethylene and derivatives; propylene, including on-purpose and methanol based routes, and derivatives; C4 monomers; aromatics; oxides, glycols and polyols and derivatives; chlor-alkali, ethylene dichloride, vinyl chloride monomer, and polyvinyl chloride; polyolefins – solution, slurry and gas phase; alpha olefins and poly alpha olefins; polyethylene terephthalate – bottles and fiber; polystyrene – general purpose, high impact and expandable; styrenics – such as acrylonitrile butadiene styrene, acrylonitrile-styrene, and acrylonitrile styrene acrylate; specialty polymers including poly-oxymethylene, super absorbent polymers and poly-methylmetacrylate; and nylon 6, 6-6 and intermediates. The production of fine chemical products in large and small batches requires a tremendous degree of flexibility. Benefit from the international suppliers that we can increase your productivity. Improve your flexibility and the utilization of your assets, raw materials, data and processes. Reduce your set-up times and downtimes while accelerating the introduction of new products and processes to the market. Optimal plant performance, continuous transparency, tailored quality, and short development and set-up times. The production of fine chemical products in large and small batches requires a tremendous degree of flexibility. Benefit from the international suppliers that we can increase your productivity. Improve your flexibility and the utilization of your assets, raw materials, data and processes. Reduce your set-up times and downtimes while accelerating the introduction of new products and processes to the market. Do you want to increase the availability and supply reliability of your plants? Contact us to offer you the best possible goods, resource and energy management integrated solutions and services for air separation and auxiliary plants. And discover how you can achieve greater transparency for your goods flow and process and plant reliability throughout the entire lifecycle with our support.